A while ago, I wrote a post, Not Spending A Cent For A Day, because I believe in saving. Of course, everyone wants to earn more money and it might not always be possible to get more. However, it is possible to have more on your account by saving more. Here are some more simple steps I am taking to get more value out of my money. Hope it will be helpful for you guys too. Switch off light and power point whenever not required. Use energy saving blues (CFL or LED) and water efficient appliances to save money on electricity. They may be a bit expensive to buy but will save money over the long run. Choose a credit card with a low interest rate, especially if you are paying interest. Over years, you will save heaps of money on interest. If you have many credit cards, consolidate and you will save in annual fees and other administrative fees. Buy a car at the end of the financial and calendar years and do not forget to ask for discounts. Make a list of what you want to buy before going grocery shopping and stick to only those items stop impulse buying. Try the 30 days list idea and stick to it. It will save you heaps of money. Double the quantity of recipe when cooking which saves you time and money. I cook for lunch and dinner. Reuse the 3D glasses in cinema. It costs $1 every time you buy them. Always use discount pharmacy and generic medicine. They are always cheaper and have the same active ingredient. If you are thinking about a holiday, try to go away outside the school holidays if possible. You will get cheaper deals on flights and accommodations. If you are flying, try to fly midweek as Fridays and weekends are more expensive. In addition, mornings and evening flights are expensive than afternoon flights. Premier cuts of meats are very expensive like a kilo of lamb cutlets are $40/kg while if you buy secondary cuts; they are cheaper and taste the same. Always buy seasonal fruits and vegetables, as they are cheaper and tastier. When getting insurance, shop round and if you see the cheaper options, tell your insurance company. As the market is so competitive, there is a higher change that they will match the price otherwise you can always switch to the cheaper ones. Do make sure that you are getting the same level of coverage though; or you may end up paying more money later. Always open an offset account for your home loan and it will save you lots of money on interest saved over the lifetime of the loan. If you use certain brands/ shop more, subscribe to their newsletter and keep an eye on the specials. I have saved heaps buying things on discount. If you are going to dine in expensive restaurants for special occasions, check their website for early menus or fixed menu rather than á la carte. They are cheaper and you can enjoy the same food and quality. If you use your mobile a lot, look for plan options like cheaper calls or data only plans depending on what you use a lot and it will make a difference on your monthly bills. Avoid plans if possible and stick with prepaid, as you will have control on how much you are spending. Use cold water for the washing machine and it helps your clothes last longer and also save money on electricity. If you live in a country where tap water is good for drinking, stop paying for expensive-bottled water. If you have cable, check how often you watch it. As all of us are so busy, it might be worth buying the movies/ series online rather than subscription for the cable. Exercise is very important but you don’t have to pay for a gym subscription instead run in the park, practice yoga in front of the TV or pay as you go for swimming. Skip the delivery and pick up your meals. For us we save $8 every time we order pizza if we choose to pick up rather than get it delivered. If you have a big family, shop in bulk and save. I am sure some of you already do most of these but of course you could always do more. If you google, you will find lots more tips and tricks online to help you save. My logica is if I can’t make more money, I will cut my spending and as a result the savings in my bank will increase. Be money wise and good luck. 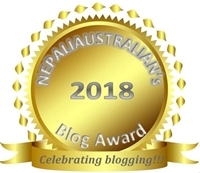 This entry was posted in General and tagged Australia, australian, credit card, home loans, impatience, M from nepaliaustralian, money, nepali australian, Nepali blog, Nepaliaustralian, savings, shopping, ways to save money. Bookmark the permalink. good tips on washing machine, i never thought of that.